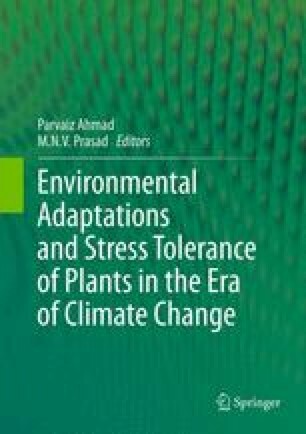 Plants are commonly exposed to large number of different environmental stresses including extremes of pH and temperature, flooding, drought, high salt, both organic and inorganic contaminants, and a variety of pathogenic organisms. As a consequence of these environmental stresses, plants typically synthesize increased levels of the phytohormone ethylene and are often unable to grow and proliferate to any great extent, at least until the stress is removed and the ethylene level is lowered. To reduce the deleterious effects of ethylene stress, plant growth-promoting bacteria (PGPB) that facilitate the proliferation of plants under stress conditions may be added to the system. These bacteria lower the level of growth inhibiting stress ethylene within the plant through the action of the enzyme ACC deaminase, and are also able to directly promote plant growth, usually by providing the plant with the phytohormone indoleacetic. The net result of adding PGPB to plants is a significant increase in both the number of seeds that germinate and the amount of biomass that the plants are able to attain under otherwise stressful and inhibitory conditions. In this chapter we provide a detailed overview regarding the functioning, the biochemistry and the regulation of ACC deaminase, with emphasis on application of PGPB synthesizing this enzyme and supporting plant growth under abiotic stress such as salinity, flooding, drought, organic, and inorganic pollution. Finally, recent developments on the exploitation of transgenic plants expressing ACC deaminase are discussed.